I hope you don't have a heart condition, because what you're about to read might make that beating mass in the center of your chest burst with the type of feelings overload that can only be prompted by a human interest piece about Australia's oldest man and his adorable, inspirational hobby. 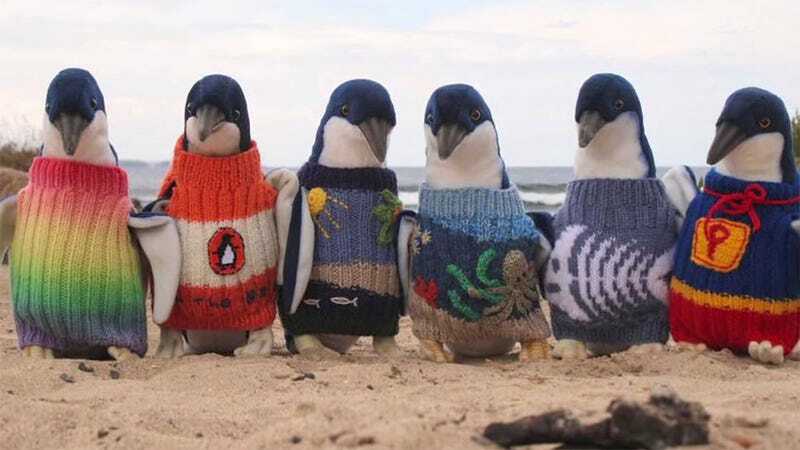 Alfred Date (who goes by Alfie) has been knitting sweaters for hurt penguins since 2013 when nurses at the retirement community in which he lives asked him to make some for penguins that had been affected by oil spills. Date, who, according to Mashable, has been knitting since the 1930s, couldn't refuse. This is a guy who spends his free time knitting beanies for premature babies; who was he to say no to penguins? Date, who says the secret to his longevity is just "waking up every morning," is no longer knitting sweaters for penguins (Victoria's Phillip Island Penguin Foundation says they now have enough due to donations coming in from all over the world), but he continues to keep healthy and active by knitting for his friends and family. That's got to keep him busy: He's got seven kids and over 40 grandchildren and great-grandchildren.